Long ago, when families and friends lived close, baskets full of home baked goods were a popular holiday gift. Well you may not be able to walk next door with a basket full of home baked goodies like they did in the Christmases of yesteryear, but you won't hear any complaints when they receive this colossal gourmet Christmas gift basket! Incredibly Moist Cayman Island Rum Cake from the Tortuga Rum Co. This Christmas gift basket features a large and very beautiful basket with a plaid holiday fabric lining that is filled with many delightful holiday goodies. 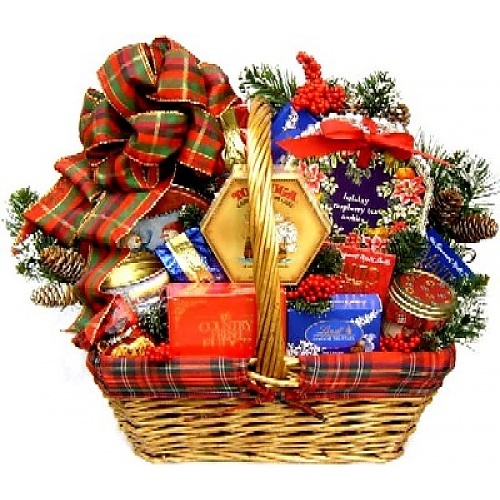 This oversized Holiday gift basket is trimmed with frosted pine, berries and topped with a beautiful bow. It's breathtaking!! !